Many businesses are moving to cloud computing because it is cost-effective, and saves customers of heavy lifting. This can be greatly attributed to the leverage of monitoring. Monitoring service provides real-time operation data for you to identify risks in advance, avoid potential loss, and troubleshoot as quickly as possible. 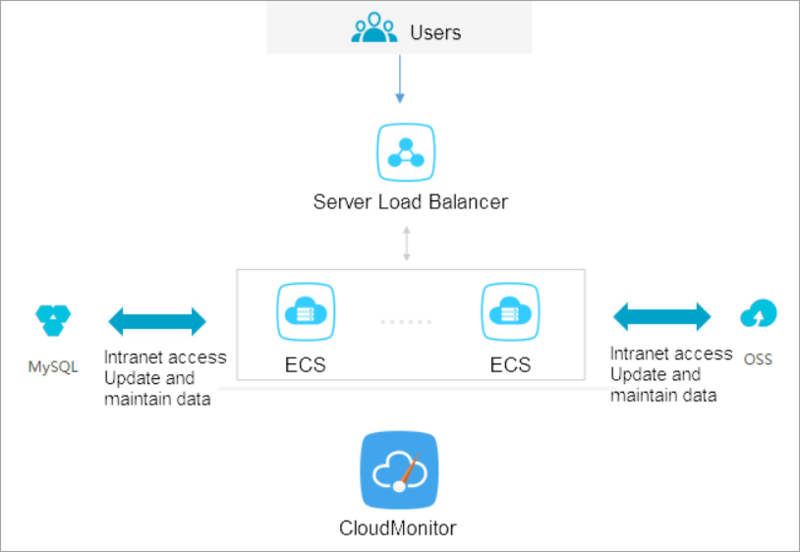 This article takes a website for example (the website architecture is shown as follows) to illustrate how to configure CloudMonitor. The example website uses Alibaba Cloud services such as ECS, RDS, OSS, and Server Load Balancer. Make sure that your ECS monitoring agents are functional to collect metric data. Otherwise, you must install the agent manually. For more information, see How to install CloudMonitor agent. Add alarm contacts and contact groups. We recommend that you add at least two contacts to make sure real-time responses to monitoring alarms. For more information about metrics, see Cloud service overview and alarm overview. With CloudMonitor Dashboard, you can gain system-wide visibility into resource utilization and operational health. You can select a metrics dimension. You can choose per-instance metrics dimension if you only have several instances. Otherwise, you can choose ECS groups dimension or user dimension, and choose the average value. We recommend that you set the alarm threshold according to your business status. A much lower threshold may trigger alarm too often and render monitoring meaningless, while a much higher threshold may leave you with no time to respond to a major event. Take CPU utilization as an example. We have to reserve some processing capacity to guarantee the normal function, so you can set the threshold to 70% and to trigger an alarm when the threshold is exceeded by three times in a row, as shown in the following figure. If you have to set alarm rules for other metrics, click Add Alarm Rule. For Web applications, you can add monitoring for process . For more information, see Process monitoring. Site monitoring is at the network access layer to test the availability. 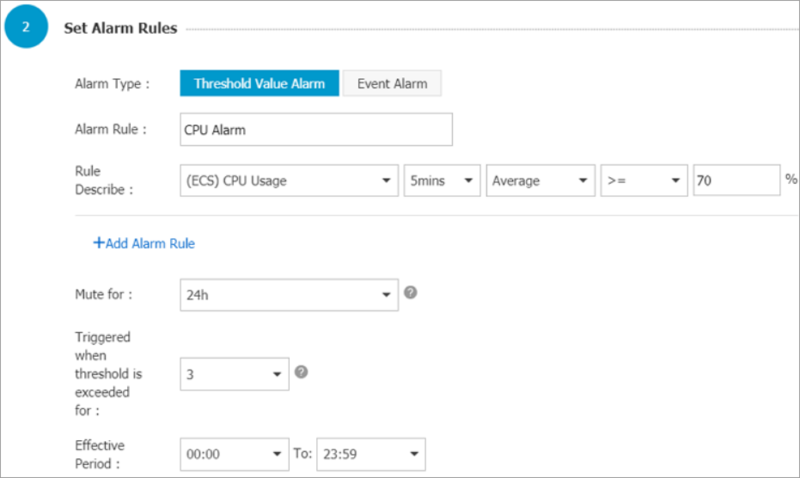 We recommend that you set the RDS CPU utilization alarm threshold to 70% and to trigger an alarm when the threshold is exceeded by three times in a row. You can set the disk utilization , IOPS utilization, total connections and other metrics as needed. Before you begin, make sure that you have enabled health check for your Server Load Balancer instance. You can use Custom monitoring metrics if the metrics you need are not covered.